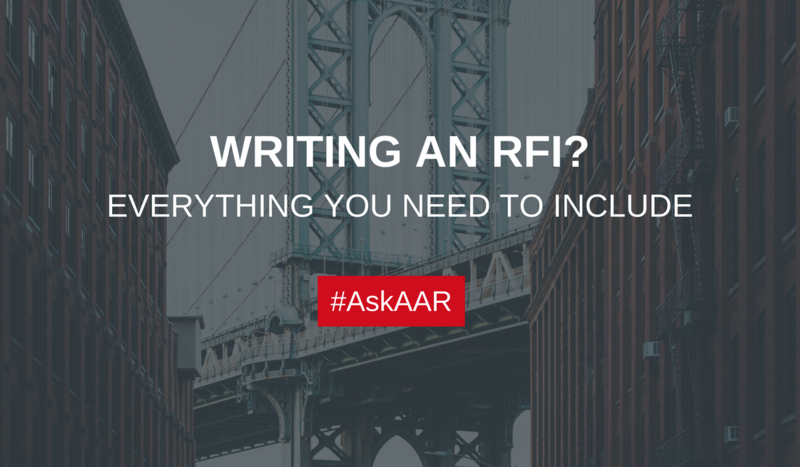 What All to Include Inside Your RFI #AskAAR from AAR Partners on Vimeo. This one is a loaded question and I’ve recently written a white paper on how to write a proper RFI. However, I will share some key points when crafting an RFI for a review but first, keep in mind that an RFI is basically the foundation of the entire search. A well-written RFI will lead you to select the best agency for your brand. So what do you need to include? It’s a mini brief – think micro brief questionnaire. Be sure you share loads of details about the brand, the company and more before asking a single question. It’s a questionnaire – include questions that get to the heart of the marketing matters so you can see if the prospective agencies have relevant experience. It’s a cultural assessment – compatible culture is key for a successful relationship so include some questions that allow you to get a sense of the agency’s internal culture. Stewardship – The last thing you want to do is search for a new agency two years from now so be sure you ask questions that allow you to get an understanding of how the agency builds long term relationships. Creativity – brands live and die on creative breakthrough so be sure to ask questions that give you a solid sense of the agency’s creative development and how they remain innovative. Again, an RFI is much more than just a questionnaire. You want to be sure you’re giving a mini brief to the agencies so they can make a comprehensive decision of whether or not their experience and capabilities are appropriate for your brand. And that’s why the RFI is the foundation to finding the perfect agency partner for your brand’s needs.